This artist's concept features NASA's Mars Science Laboratory Curiosity rover, a mobile robot for investigating Mars' past or present ability to sustain microbial life. Curiosity is slated to launch toward the Red Planet on Nov. 26, 2011. NASA's newest Mars rover, Curiosity, is one in a long line of spacecraft to be powered by the radioactive element plutonium. Yet, with this chemical quickly becoming scarce, it may be the last, scientists worry. Curiosity is scheduled to launch Saturday (Nov. 26) on a groundbreaking mission to the Red Planet. When the car-size rover reaches the surface of Mars next August, it will be powered with a special type of the element, called plutonium-238. For 50 years, NASA has used plutonium-238 as the fuel source for unmanned spacecraft to study planets and other objects in the outer solar system, but stockpiles of this material are running dry. Without additional stores of this fuel, the agency's ability to conduct future planetary science is in jeopardy. That is something the United States simply cannot afford, scientists say. "It's like having a car and no gasoline in the car," said Ralph McNutt, a planetary scientist at Johns Hopkins University's Applied Physics Laboratory and a project scientist for NASA's Messenger mission to Mercury. "The development of this power system has taken place in the U.S. over five decades, and we're on the verge of throwing it all away." The NRC report was released in May 2009, and stated that plutonium-238 has been and will continue to be "essential to the U.S. space science and exploration program." The committee members recommended that domestic production of the material be restarted in order to sustain NASA's planetary science program, and to avoid delays or even cancellations of future missions. When the findings were presented, McNutt and his colleagues called it "a day of reckoning," because the country, and indeed the world, was coming dangerously close to completely running out of plutonium-238. That was almost three years ago and, unfortunately, not much has changed since then. "At that point, it was very serious, and it's still a very serious situation," Jim Adams, NASA's deputy director of planetary science, told SPACE.com. "It's a big enough problem that we've been consistently working on it now for the past three years." Plutonium-238, which is different than the type of plutonium used in nuclear weapons, emits heat that is converted into electricity. The material has been particularly useful on missions that venture into the outer solar system, where the scant sunlight cannot effectively be harnessed using solar panels. Other spacecraft fueled with plutonium-238 include the Galileo probe that orbited Jupiter, the Cassini spacecraft currently studying Saturn and its moons, and the New Horizons spacecraft that is on its way to Pluto. "We wouldn’t have 99.9 percent of our knowledge about the outer planets and their systems without plutonium-238," said McNutt. "It's just a huge amount that couldn't have been done. If we are going to keep making the kind of advances that the space community would like to make, and the sort of advances that NASA takes leadership in, we can't do it without this power supply. Without it, all of that is going to be for naught." The U.S. Department of Energy (DOE) has provided NASA with plutonium-238 to fuel power systems, called radioisotope thermoelectric generators (RTGs), on spacecraft since 1961. For a time, the material was also purchased from Russia, but that supply has since reached a dead end. Plutonium-238 has not been produced in the United States since the late 1980s. The material is a byproduct of nuclear weapons, and was last produced during the Cold War, explained Roger Launius, space history curator at the Smithsonian's National Air and Space Museum in Washington, D.C.
"The moral of the story is, there is a finite number of missions that can be powered using plutonium-238 with the current stock that we have," Launius told SPACE.com. This shortage of plutonium-238 has been a known problem within the science community for several years, but the 2009 NRC report was a rude awakening to how dire the situation really is, said Alan Stern, leader of NASA's New Horizons mission to Pluto, and a planetary scientist at the Southwest Research Institute. "It’s not too much of a stretch to say that the future of a healthy leadership position for the U.S. in 21st-century planetary science depends on access to plutonium-238," said Stern, who was also the associate administrator of NASA's Science Mission Directorate from 2007 to 2008. The precise amount of plutonium-238 still available is not public — the Department of Energy typically keeps such information under wraps. 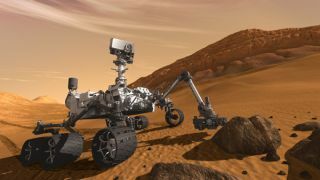 Curiosity, also known as the Mars Science Laboratory, is carrying almost 8 pounds (3.6 kilograms) of the radioactive fuel. After that, scientists estimate that there is enough plutonium-238 left for only one more flagship planetary mission. "We're down to one more trip out to do some exploring, and that's it," Stern said. "It’s just crazy. To be that close to the edge before we’re out of capability is irresponsible." Earlier this year, the National Research Council released its Planetary Science Decadal Survey, which represented a consensus of the broad scientific community's goals for planetary science over the next 10 years. The highest priorities outlined in the decadal survey included a series of sample return missions to Mars, and a mission to explore Jupiter's icy moon Europa. The estimated $4.7 billion Europa mission, called the Jupiter Europa Orbiter, would require an RTG power source fueled by plutonium-238. "We've got enough plutonium in our stockpile now to meet the needs of NASA through the end of the decade — through 2020 or so," Adams said. But in order to plan exploration missions beyond that timeframe, the plutonium-238 shortage will need to be addressed. So far, there is no substitute power system that is as safe, effective and reliable as plutonium-powered RTGs, McNutt said. NASA has been conducting research on next-generation systems that convert a greater percentage of heat from plutonium-238 into electricity, which would essentially require less of the material per mission. But these systems have yet to be adequately tested. McNutt estimates that restarting production of plutonium-238 would cost approximately $50 million-to-$75 million over the span of five years. This issue of funding typically has been where advocates found the greatest roadblocks. Launius, who was also part of the 2009 NRC committee, said the proposal to restart production of plutonium-238 raised complicated budgetary questions in Congress. "The DOE was interested in helping out NASA, and NASA was interested in having this done," Launius explained. "Neither side was able to come to terms with reinstituting a line of production and the annual cost thereafter associated with this." Even though NASA would be the primary consumer, the two agencies proposed splitting the cost of production. "[The] DOE is responsible for maintaining the national capability to support the development, production and safety of radioisotope power systems for national security and space exploration missions and it is committed to achieving that mission," Alice Caponiti, program director for infrastructure capabilities at the Department of Energy, told SPACE.com in an email. "The Administration's budget request for FY12 proposed a cost-sharing arrangement between DOE and NASA to fund this work." But the funds for NASA and the DOE are appropriated by two separate congressional subcommittees, and key lawmakers have failed to reach an agreement that would grant the DOE the necessary financing to restart production of plutonium-238. "I believe there are certain individuals on the congressional committees controlling the Department of Energy who are set against this," Stern said. "They're in a position to make sure it doesn’t happen, and they've been very effective for years now. We now have to have the Russians get us to the space station, we can't explore the moon the way it was when I was a boy, and now we're going to take away our ability to explore the deep-outer solar system. It's very disappointing, and it's debilitating to the U.S. As to the people who are roadblocks to this, they need to be exposed. This is unpatriotic." The lack of agreement on this issue has caused "severe frustration" among scientists, who see the very future of planetary science as at stake, according to McNutt. "If I could, I would write a check for $10 million," he said. "Given what we're talking about, and given where we are, from the outside looking in, to not do this would appear to be a very 'penny-wise but pound-foolish' decision." Furthermore, even if production of the material could begin right away, it would be years before a new store of plutonium-238 is available for use. "It's not like flipping a light switch," McNutt said. "There's a certain amount of time that it takes to cook the plutonium-238. A lot of chemical processes have to occur, and all these things take time." "At the planned production rate of up to two kilograms [about 4.4 pounds] per year, target fabrication and target processing can be accomplished in existing facilities modified as needed for upgrades to equipment and support services," Caponiti said. "It will take approximately six to seven years to reach this rate of production, depending on the funding profile." Planetary scientists are hopeful that an understanding of what is at stake and a plan to address the issue will gain traction among lawmakers who have the ability to fix the problem. "It's easy to throw rocks at Congress these days," McNutt said. "But, given all the very large, pressing problems, it's not the sort of thing that tends to get people's attention. There are some people who legitimately feel like this is simply not a priority, that there's not enough money and it's not their problem. But I think if you try to step back and look at the forest and not just the individual trees, this is one of the things that has helped drive us to become a technological powerhouse. What we've done with robotic space exploration is something that people not just in the U.S., but around the world, can look up to." For now, members of the planetary-science community have made it a priority to get the word out and educate not only politicians but the public as well. "What we tried to do in the 2009 report is really point out the downside of the U.S. getting out of the business of producing this material," McNutt said. "We wanted to make sure that nobody, a few years from now, could say, 'I didn't realize that this was going to be such a problem and that we couldn't just turn around and fix the problem overnight.' Because we can't."